Last year, Starbucks acquired San Francisco bakery chain La Boulange, which has been turning out deliciously authentic French pastries since 1999. The plan was to raise the bar for croissants and all of the other pastries in Starbucks cafes by upgrading them, serving more authentic pastries made with the same artisan techniques that La Boulange has been using since its inception. La Boulange did some high volume production in the Bay Area, but it needed to scale up production to be able to supply Starbucks’ west coast stores with pastries before they could be rolled out (and used as a model for other baking facilities across the country) officially. The original estimate suggested that the integration of La Boulange products would take up to five years – but now, at just about 18 months into the project, they are already launching. 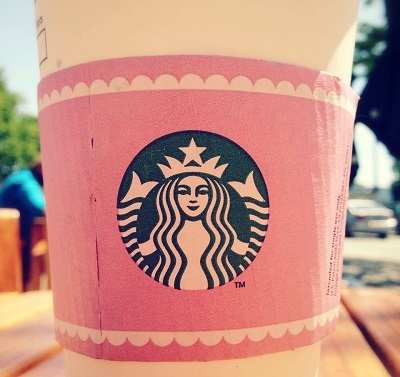 Starbucks stores across the country (starting on the West Coast) are turning pink, since pink is the color for the La Boulange branded items. Just about all of the items in the pastry case will be replaced with La Boulange products – from croissants to cakes – and served with pink wrappers in pink bags alongside drinks with pink sleeves. Almost every pastry item will be served warm so you get that fresh baked smell and taste. Lunch items will include warm sandwiches and piadini, and a limited number of prepackaged salads and sandwich kits of sliced meats, greens, etc. Early reviews are mixed, since a lot of customers feel strongly (for whatever reason) about the color pink and others simply don’t like change and would prefer to stick to the same pastries that have been around for years. Others love the change. The pink is probably a limited time promotion, but La Boulange products will be here to stay, so they’re definitely something to keep any eye out for!